The finding, published in the Journal of the American Chemical Society, may pave the way for the design of more effective catalysts for selective hydrogenation reactions. Selective hydrogenation is the key to producing valuable chemicals, for example, turning triple-bonded hydrocarbons called alkynes selectively into double-bonded alkenes—starting materials for the synthesis of plastics, fuels and other commercial products. “Understanding how molecular hydrogen interacts with ceria [cerium oxide, CeO2], however, is a big challenge, as no regular technique can ‘see’ the light H atom. We turned to inelastic neutron spectroscopy, a technique that is very sensitive to hydrogen,” said ORNL chemist Zili Wu. At ORNL’s Spallation Neutron Source (SNS), a DOE Office of Science User Facility, a neutron beam line called VISION probed vibrational signals of atomic interactions and generated spectra describing them. “Because neutron spectroscopy could ‘see’ hydrogen due to its large neutron scattering cross-section, it succeeded where optical spectroscopy techniques failed and enabled the first direct observations of cerium hydrides both on the surface and in the bulk of a cerium oxide catalyst,” Wu said. In vehicle engines, oxygen is needed for hydrocarbon fuel to burn. The exhaust that is generated contains deadly carbon monoxide and unburned hydrocarbons. In the catalytic converter, the catalyst cerium oxide grabs oxygen from air and adds it to carbon monoxide and hydrocarbons to turn them into carbon dioxide, which is nonlethal. The finding that cerium oxide may grab hydrogen as well as oxygen is promising for efforts to engineer it to catalyze both reactions that cause electron gain (“reduction” of a reactant) and electron loss (“oxidation”). At the Center for Nanophase Materials Sciences (CNMS), a DOE Office of Science User Facility at ORNL, the researchers made nanoscale crystalline rods of cerium oxide with well-defined surface structure to facilitate an understanding of catalytic reactions that would be difficult with commercial, normally spherical particles of cerium oxide. The nanoscale rods allowed them to differentiate hydrogen in the bulk from hydrogen on the surface, where catalysis was presumed to happen. The first observation of hydrides both on the surface and in the bulk of ceria was important because it established that the bulk of the material also can participate in chemical reactions. Also at CNMS, Wu and Guo Shiou Foo performed in situ experiments using infrared and Raman spectroscopies, which scatter photons to create spectra that give “fingerprints” of atomic vibrations. Unfortunately, these optical techniques “see” only vibrating oxygen–hydrogen bonds (from stretching between oxygen and hydrogen bonds); they are blind to hydride species on ceria. To see the hydrogen interactions directly, the researchers had to use SNS, where Yongqiang Cheng, Luke Daemen and Anibal Ramirez-Cuesta performed inelastic neutron scattering. 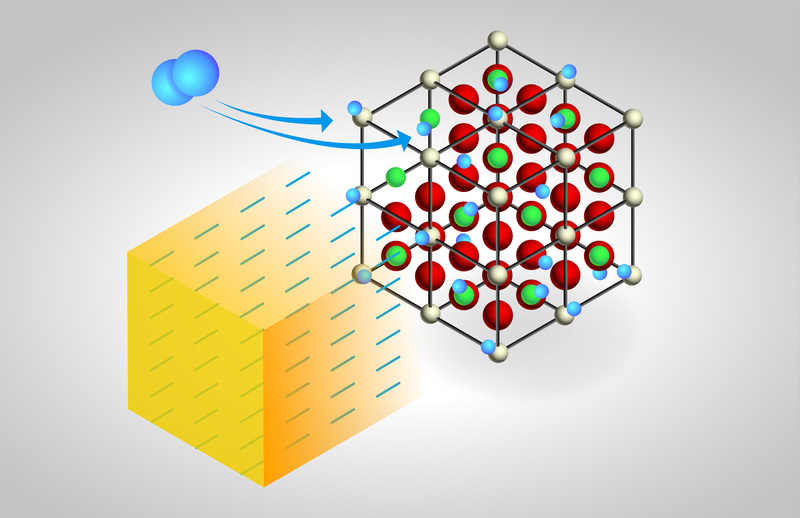 Meanwhile, Franklin Tao, Luan Nguyen and Xiaoyan Zhang of the University of Kansas used ambient pressure X-ray photoelectron spectroscopy to characterize the oxidation state of cerium oxide, which was critical to deriving the mechanism. Moreover, Cheng, aided by Ariana Beste of the University of Tennessee, created theory-based simulations of vibrational spectra of neutrons and compared them with experimental observations. This teamwork was essential to providing a deeper understanding of the interaction between molecular hydrogen and cerium oxide-based catalysts. The current neutron study used VISION to explore the nature of hydride species in the catalyst. Further studies will also employ another beam line, NOMAD, to characterize the exact structure of both the surface and bulk hydride in the catalyst to reveal, for example, if oxygen vacancies form channels in the bulk to bring in hydrogen and spur further hydride formation. What is more important, the researchers will take advantage of NOMAD’s ability to measure diffraction patterns at temperatures at which chemical reactions occur. Adding hydrocarbons, they will explore and reveal the catalytic role of the surface hydride versus the bulk hydride in hydrogenation reactions. The understanding they build will facilitate the design of more effective cerium-based catalysts for diverse applications. The DOE Office of Science supported the research. Computing resources were made available through ORNL’s Laboratory Directed Research and Development Program.